SHURFLO 2088 Series diaphragm pumps deliver reliable performance in high flow, moderate pressure applications. 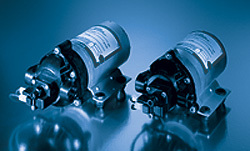 They are used in a variety of transfer and dispense-on demand applications where flow to 3.6 GPM is required. For added reliability the Twist-on Strainer can be used on the 2088 inlet port. Install optional 4″ or 5″ heatsink for heavy duty applications where extra cooling is required. 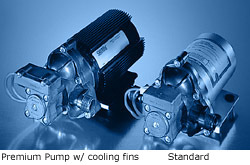 SHURFLO 8005 Series demand pumps provide the same reliability as the 12 VDC version, with flow rates up to 1.6 GPM (6.1 l/min). They are ideal in industrial applications that require high pressure, with low amp draw. They can be mounted in any position, are compact, and are design for easy maintenance. Reliable performance in high flow, moderate pressure applications. May be mounted in any position, are compact, and are designed for easy maintenance.